Hybrid Racing Fuel Line Kit - Dezod Motorsports Inc - Home of the automotive performance enthusiast since 2002. The Hybrid Racing Tucked fuel line kit was designed for those people looking to clean up there engine bay and eliminate the OEM fuel filter off of the firewall. The kit routes the fuel lines between the number 2 and number 3 runners and hugs the transmission as it makes its way to the regulator which you will mount below the brake booster. This kit only works with the Hybrid Racing Fuel rail which has the necessary port in the center of the rail. So why do you need a fuel line kit? Well the K-Series engine in the OEM chassis has a return less fuel system (it only has one line running to the rail) . The new chassis that you plan on installing your K-Series engine (in this case EG,EK,DC etc) utilizes a return system. So to get fuel to your K-Series engine your going to need to retro fit a return system to the engine. It sounds complicated but we have made a few different fuel line kits that are 100% bolt in. What chassis is this kit for? This kit fits all 92-2000 Civic’s/Delsol’s and all 94-2001 Acura Integra’s. What does this kit come with? This kit consist of 4 custom length lines with the appropriate fittings on the ends. You can get the lines in either stainless steel or black neoprene. The black kit is our most popular kit for its stealthy look but they both get the job done perfect. The kit also comes with 3 -6AN unions and 2 adapters to connect to your hard line. Why shouldn’t I make these lines myself and what makes them better? 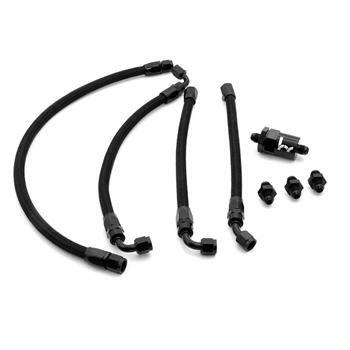 Since the hoses will be carrying fuel back and forth to your engine we have the lines assembled and pressure tested by an Aeromotive authorized dealer who uses equipment selected and certified by Aeromotive to ensure the best quality assembly and performance. They also pressure test the lines to ensure there are no leaks which can lead to fires and or engine failure. In addition all of lines come with a lifetime warranty. If you have a leak or problem send it back to us for a no hassle repair. We stand behind each one of our products and are 100% positive that you will have no problems with our fuel line kits.